Charleston Harbor Resort & Marina is located in Mount Pleasant, SC. Adjacent to the famous USS Yorktown, this wedding venues offers 10 inspired venues, ranging from The Yacht Club with a nautical feel, to bridge Bar overlooking the Charleston skyline, to Charleston Harbor Fish House Porch beautiful and wonderful meals, to The Harbor Room At Charleston Harbor Fish House a private small room, to Atlantic Ballroom at the Harbor Terrace. 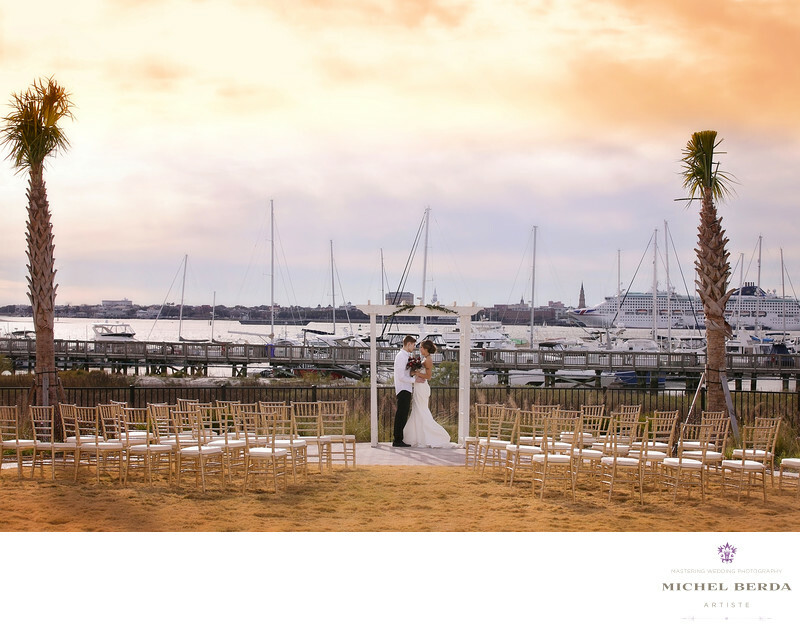 Have your ceremony at Harborside Beach or Harborside lawn, with breathtaking views of the Charleston Harbor, or maybe at Mariner's Walk Pier featuring Charleston Skyline with the perfect sunset. Your reception can take place at Sunrise terrace & Deck open space overlooking the Charleston Harbor, Or a unique place of its own Lookout Pavillion a premier outdoor venue with fireplace and can hold up to 350 wedding guest. Since I saved the best for last, The Beach Club Event Lawn, my favorite spot of this entire resort, the well manicured lawn and breathtaking views of our Holy City of Charleston, SC, set the perfect tone for romance and beautiful sunsets...This is where I created to amazing wedding image at Charleston Harbor Resort Marina that showcases just that a tranquil magical, blending waterfront views, wedding dreams, with a southern chic southern flair. I love this wedding image truly a great capture. Keywords: Charleston (1179), Charleston Harbor Resort Marina Wedding (3), Charleston Harbor Resort Marina Wedding Photographer (3), Charleston Harbor Resort Marina Weddings (3), Michel Berda (1140), mount pleasant sc (9), Mount Pleasant weddings venues (3), photographer (1125), southern weddings Charleston Harbor Resort Marina (3), Wedding Photographer (1254).